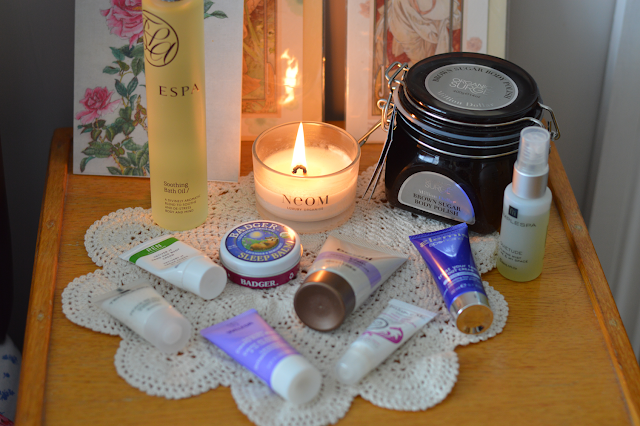 I don't know about you but I sleep so much better knowing I have given myself a little treat, I wanted to share with you some products which I use to help me unwind and relax. 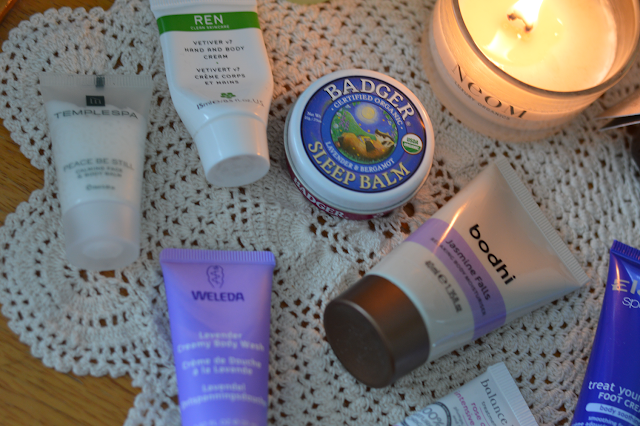 I have a pre-bedtime routine which inloves a handful of products. But at least once a week I have what I call a Home Spa Pamper. This involves candles, a relaxing bath and lovely relaxing body products. 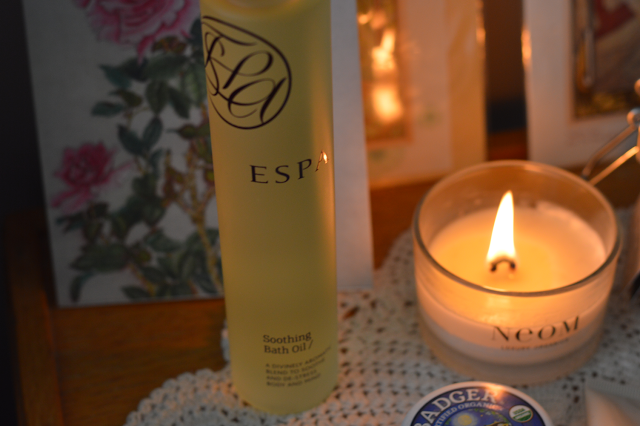 I start my pre-bedtime routine with a relaxing bath, I've been trying the Soothing Bath Oil by ESPA. This is the perfect pre-bedtime product to use especially if you have difficulty unwinding and settling before bedtime. The soothing aromatic blend of sandalwood, rose, geranium and frankincense help you to unwind and relax. Great for days when you've been busy or felt a little stressed. Myrrh helps soothe the mind while sweet almond nourishes the skin. Once you've enjoyed a bath using this you won't want to use anything else! I like to add 2-3 capfuls to running hot water, light a candle and close the door and let all the beautiful aromas fill the room. My favourite candles are without a doubt Neom, they are high quality organic candles which you can trust. They fill the room with their beautiful scents helping you to change your mood when you need it. Whether you need to fill invigorated or relaxed these candles are truly amazing! When I'm trying to relax I always call upon the Tranquillity scent. This is the travel size, it still burns for 20 hrs! I save this one especially for my pre-betime rituals. I love using the Weleda Creamy Body Washes, they are the best creamy body washes I've ever tried. Great for a treat and perfect for dry skin, I like to use the Lavender one. This is a travel size but the full size product is a purse friendly £7.95. Again I like to save this and use this for my pamper session. The newest product to join my ritual is the Organic Surge Million Dollar Brown Sugar Scrub, when you see this you just want to scoop it up and eat it! Of course I wouldn't recommend that, you'll soon be heading for the sink and a glass of water. It looks and smells divine, this is the perfect combination to use with the bath oil. The organic brown sugar crystals work effectively yet gently to remove dead skin cells and help to improve the skins appearance inside and out.The natural organic oils lock in moisture, freshly scented with sweet orange and bergamot. This is definitely a scrub to add to your wish lists this year if you want to treat yourself! After relaxing and finally dragging myself out of the tub, I rely on a few nice moisturising goodies to lull me into a sleep! Bodhi Jasmine Falls Relaxing Body Moisturiser fits in nicely, the relaxing aroma of Jasmine and Lavender helps to calm and de-stress the mind. It's not just a relaxing scented product, it's actually very moisturising thanks to the organic shea butter, kukui nut and coconut oil. Another one to add to your lists. For the hands I've been using the REN Hand & Body Cream, a great all rounder. I like the scent and the formulation. I would definitely repurchase the full size of this. Elemis treat your feet Foot Cream is rich in formulation and adds to the whole bed-time ritual. It's nice to treat yourself from your head down to your toes! Infused with a blend of aromatic patchouli, eucalyptus and lemon oils help to soothe and comfort. 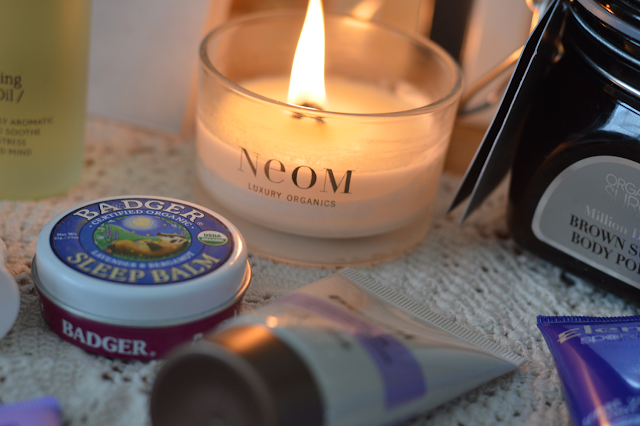 The last product in my pre-bedtime ritual is the Badger Sleep Balm, I rub a little of this just before I turn off the light. I like to rub a little on my temples and wrists. And after writing up this post, I actually feel well and truly relaxed!